Home » Dessert Recipes » Turtle Trifle – make a rich and creamy dessert filled with chocolate, nuts, and caramel. Turtle Trifle – make a rich and creamy dessert filled with chocolate, nuts, and caramel. 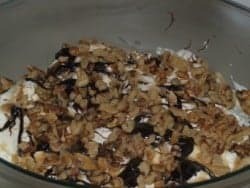 Turtle Trifle is mascarpone cheese, whipping cream, nuts, chocolate, and caramel sauce make up a wonderfully rich dessert. Everyone will want to know where you got this recipe for Turtle Trifle. When I have brought this turtle trifle to parties and pot luck dinners, I never have to take any home. Thanks to cheyenne for sharing this dessert recipe. Make a rich and creamy dessert filled with chocolate, nuts, and caramel. 1. Beat mascarpone, whipping cream, & vanilla in a large bowl at medium speed w a heavy duty electric stand mixer using whisk attachment, 2 to 3 minutes or until smooth and firm. Place half of pie cubes in bottom of a 4-quart trifle dish or tall, clear 4-quart glass bowl. Spread half of whipped cream mixture over pie cubes. Drizzle with half each of chocolate fudge topping and caramel topping. Sprinkle with half of the chopped pecans. Repeat layers. Cover and chill at least 1 hour or up to 8 hours. I brought this to a pot luck last night, it was gone quickly. Very tasty, and I received many compliments on this dish. I just made this dessert, but my Smuckers toppings were too thick to drizzle. I tried to heat them but not successfully. Can I mix something with them to drizzle? Maybe a little bit of cream would do the trick.